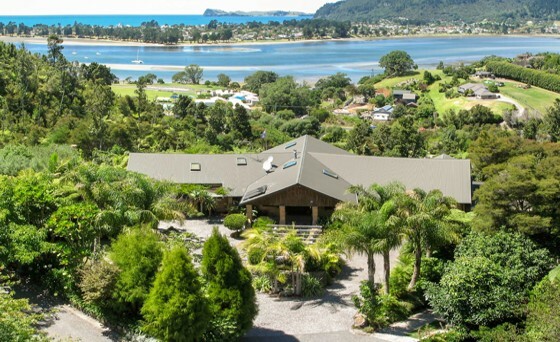 The sweeping panoramic views not only encompass Tairua estuary but also Pauanui, Slipper Island and the Pacific ocean and can be viewed from all rooms. A vista bringing lasting memories. Colleith Lodge offers a spa and swimming pool for your enjoyment. There are three tastefully furnished guest rooms and each room has it’s own ensuite bathroom with wet shower and one offers a spa bath. Bifold doors open to private patio areas which look over the lap pool. Two rooms have queen beds, one room has a superking bed, or twin beds. Complimentary tea and coffee are available in the dining room and an inviting breakfast is served inside, or alfresco on the patio. Colleith Lodge is a non smoking environment. At Colleith Lodge, guests are invited to enjoy the beautiful in-ground lap pool, spa pool and patio area which overlooks native bush, harbour and surf beach. For those wishing a more scenic water experience, there are kayaks available for your use. The Coromandel Range runs through the centre of the peninsula and the towering peaks present a haven for tramping and mountain bike enthusiasts, or for those who simply wish to commune with nature. Colleith Lodge is within walking distance to the estuary, village and Tairua Ocean Beach. Golf courses, bush walks, Hot Water Beach and Cathedral Cove are on the doorstep - the Coromandel Peninsula is famous for it's beaches, native bush, Kauri forests, historic gold trails and glow-worms.